So the mighty Arsenal travel north to Glasgow to take on the Bhoys of Celtic Park tonight in what is easily the toughest Champions League play-in tie I can remember. Seeing as kickoff is in a mere two hours (7:45pm BST/2:45pm EST), this won't be too in-depth, but I thought it would be good to have a quick preview of this away leg. First of all, all need to bear in mind that the winner of this tie will benefit to the tune of 40 million pounds. For our American readers, that's $66 million. The loser of the home-and-away tie will be dropped into the Europa Cup, a far less prestigious competition featuring the likes of Fulham. Taking nothing away from Fulham, but they're hardly Barcelona or Madrid, are they? That competition would net a team far less in the way of revenue, and while the bean-counters and the respective boards of the two clubs are aware of it, you'd have to think that the players and managers are just as in-tune to this fact. I would imagine, however, that this is more of a point of pride for the players. Celtic have collected a fair number of big-time scalps at home in recent years in Europe (2008-09: drew Manchester United 1-1, beat Villareal 2-0. 2007-08: beat Milan 2-1, beat Benfica 1-0. 2006-07: beat Benfica 3-0, drew Manchester United 1-0, drew AC Milan 0-0), but have just one win away from home in Europe in the last 6 years. This obviously suggests that should the Gunners pull a positive result (a win or at least a draw with goals), they're likely to go through. It certainly won't be easy, however. Celtic have lost just once at home to an English side ('83-'84 to Nottingham Forest in UEFA Cup), and in 8 matches versus English teams at Celtic Park, they have won 4, drawn 3 and lost just the once. Which should be plenty to take a result against most teams, even if Diaby is in the squad (although personally I'd choose Ramsey if Denilson isn't fit). But on paper, Arsenal looked to have a near-equal opponent to open the Premier League season at Everton, and we all know how that turned out… it's as the saying goes, that's why they don't play the games on paper. In addition, I looked it up and historically the English and Scots don't get along so well. I know, I was as surprised as you, but Mel Gibson apparently directed a film about it a few years back. 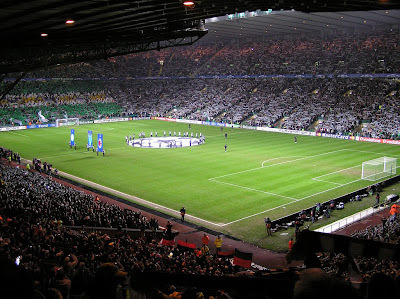 So it's legit, and we can certainly expect the Scots to raise their game, and for the home crowd (as well as the dynamite away supporters) to make for a big, big atmosphere at Parkhead this evening, which would be amazing to be there for, but will certainly translate to the television/hopefully-decent-internet-feed. As we're approaching kick-off, I'm going to stick with my gut/superstition and predict another 2-2 draw, while hoping I'll be wrong to a tune of 6-1 to the visitors tonight. Danger Man: Aaron McGeady, winger. Quick, strong, good with the ball at his feet and is the creative heart of Tony Mowbray's club. Weak Link: Depending on whether he has a meltdown (and that's an 89% probability), Artur Boruc (GK). Danger Man: Among the many options, one would have to think Andrei Arshavin, attacking midfielder. No longer cup-tied, he's a match-winner and a game-changer. Weak Link: If Diaby plays, then it's Diaby, hands down. If not... well, after Saturday, I can't rightly think of one. Can you? TWO TEAM ENTER, ONE TEAM LEAVE! And as we know, there is only one team, the famous Arsenal F.C. Until next time, enjoy the match, and as always, you stay classy, Gooner nation.